Reflecting on what she learned about her heritage while visiting the uncharted island, April comes to the conclusion that she has more questions than answers. Sleepwalking through her journalist work, a sudden vision of May East leaves her with the resolve to get to the bottom of things. May East! She has tracked April down to the sewer lair in her quest to steal all Earthly knowledge to aid in conquering the world. 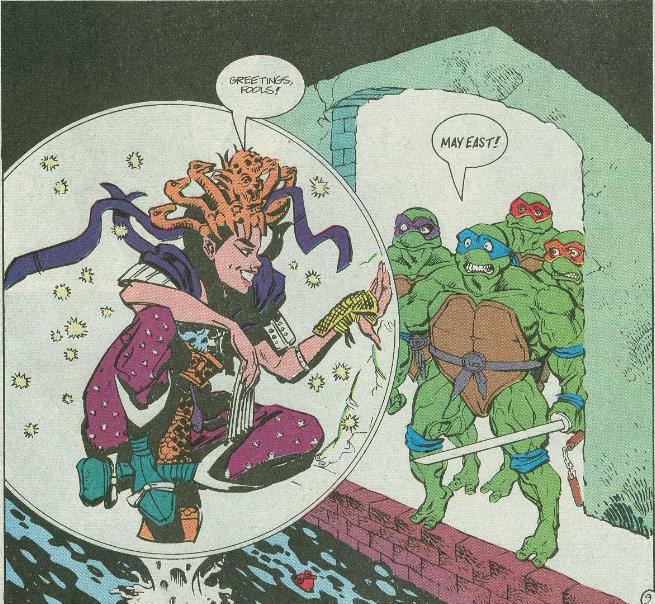 Handily defeating the Turtles in battle, May East decides to torment April some more by shrinking down and possessing Splinter; intent on sucking his brain dry. The Turtles subdue Splinter and April recovers a small crystal that May East dropped while shrinking. Carrying Splinter on a stretcher, the Turtles lead April through several subterranean passageways to the lair of the Bookwurm, located beneath the New York Public Library. Inside, they’re greeted by Splinter’s old friend, a hooded worm-man who immediately recognizes the taint permeating from April. Bookwurm has no magic abilities, though he has studied the subject thoroughly. He says that only a wizard can beat a wizard, so everyone looks to April. Picking up the crystal, April calls on her mystic heritage and shrinks herself and the Turtles down to microscopic size, sealing them in a magic bubble. 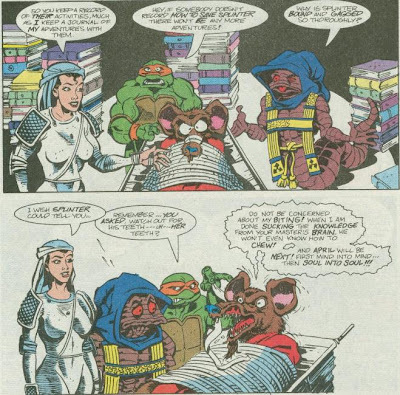 Bookwurm then places the bubble in Splinter’s ear so that they may travel into his brain and battle May East before she can absorb Splinter’s mind. *This story is continued from April O’Neil: The May East Saga #1. The story concludes in April O’Neil: The May East Saga #3. 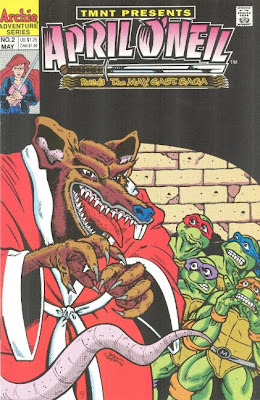 *Bookwurm previously appeared in TMNT Adventures Special #3, in the story "The Night of Monsterex". 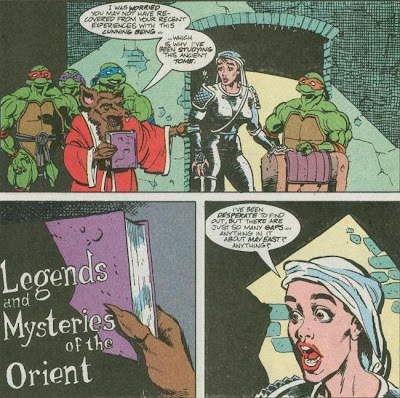 *As previously mentioned, the events of this miniseries were retroactively rendered non-canon by "The Fifth Turtle". *This issue also featured bonus pin-ups of Tattoo and Ninjara by A.C. Farley. If completely removed from the awful bookending chapters of this mini, issue #2 by itself isn’t completely terrible and follows similar formulas of much of Steve Murphy’s (Dean Clarrain’s) TMNT Adventures work. April visits the Turtles, they’re attacked by a weird creature, they seek help from another mutant, The End. So in that regard, issue #2 is probably the “best” of the miniseries, but in this case, “best” is equivocal to “not completely terrible”. There’s still a lot of unaddressed nonsense, like the Turtles having battle robot drones, and rookie inconsistencies, like Leonardo suggesting they go see Bookwurm and April later saying the suggestion was Donatello’s. The dialogue is really unnatural, too, as characters seem to be talking at each other instead of with each other; like they’re holding two different conversations. So even if this one issue follows a typical TMNT Adventures routine, it’s still a very badly written attempt. Bob Fingerman seems to have a different inker on this issue than in the first and third, and this person does a lot of "clean-up" on Fingerman's pencils. The uncreditted inker marginally improves Fingerman's character model for April, reducing the wrinkles in her face, shrinking her Mr. Magoo nose and reshaping her head so it isn’t quite as abstract. She’s still ugly, sure, but at least she doesn’t look like more of a mutant than the Ninja Turtles, now. One major problem I have with Fingerman’s April design that I failed to mention in my review for last issue is that he puts so much detail into her face, but none in her hair. Her hair ends up looking like this weird, solidly-colored, two-dimensional blob resting on top of her skull. Thankfully, once April dons her ninja hoody near the beginning of the issue, you don’t have to look at it anymore and what few strands of hair that stick out from underneath actually have inking to them. There’s just nothing nice to say about this miniseries other than, um, I dug the bonus pin-ups by A.C. Farley included in the back of the book? If you wanna see his takes on Ninjara and Tattoo then that’s the only reason I can suggest picking up this issue at a flea market. I'll admit it, I kinda like Fingerman's interpretations for possessed Splinter's facial expressions. That's about the only positive thing that really stood out to me about this mini-series. The cover is kinda creepy cool too. I suppose if Wiater deserves any credit for his story, it's that is almost seems to offer a supernatural explanation for why April is able to progress so rapidly from damsel-in-distress news reporter to highly-competent ninja and swordswoman. That said, did that fact really warrant such a radical explanation, or a badly drawn three issue mini-series?